published in Manuel Vason's new book "Double Exposures"
The image Manuel and I developed for Double Exposures is derived from a performance series "Aspiration" I am working on currently that deals with the tragic reality that so many women die every year from unsafe abortion in the world. I have been addressing the wider issue of abortion and women's reproductive rights in my work for many years as Irish women continue to make England the legal and de facto destination for abortion. 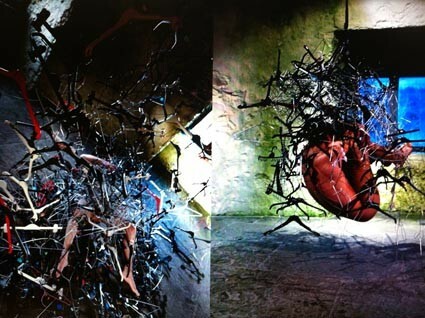 This double image is created with 700 clothes hangers in a 16th century castle at Burren College of Art where I work. The hangers are instruments that become proxys for the human body, they are also like birds in shattering flight. In the image my body is positioned as in a web, entrapped; receiving birth or giving transfiguration. Manuel's body looks like a suspended feotal heart at the center of a turbulent flock.